My Baby Learned how to Jump Today! I am so excited!? I have been sitting my 5 month old in the jumper for the past month or so.? He pretty much just hung out in it moving from side to side.? But today, all of a sudden, he just started jumping away!? It was so cute.? My husband and I were laughing because our other children didn’t learn how to jump until they were much older. Check out my cutie having a blast jumping away! 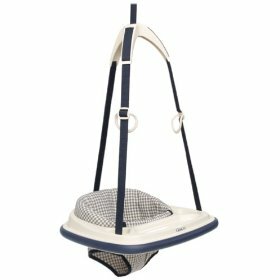 Any of you guys use the jumper for your children?? I hear mixed reviews about it.? But I am a HUGE fan of the jumper.? Some say that it is not good for a child’s development.? But I feel that as long as you are allowing them to use it in moderation – there is nothing wrong with it.? My other 2 used it until they were both almost 2 years old and their legs have developed just fine. What a cute video and how exciting!!! My son loves his jumper too and I agree that with moderation this is a wonderful item to have. Thanks for sharing! This is too cute! I love it. I haven’t heard anything about jumpers and to be honest I don’t know the point of it. I just asked my hubby and he said it is to help give them exercise and get their legs strong for walking, is that true? I am going to play this again so I can see him jump. That’s so cute! It’s a good way to keep a baby entertained plus getting some exercise. Thanks for sharing the sweet video. He looks so proud of himself!! How cute is he!